The Corporation is providing resources to strengthen Albany’s commercial districts. Please explore the available programs below. The City’s Small Business Facade Improvement Program was first launched in 2016 and renewed for a second round in 2017-18. A third round was launched September 4, 2018. The program is a matching grant program designed to assist small businesses throughout the City, providing business owners the opportunity to reinvest in their properties. Administered by Capitalize Albany Corporation, the program is made possible with funding from the Albany Community Development Agency and the City of Albany Capital Resource Corporation. The program can provide matching grants to small businesses for exterior renovations. Click on the program guidelines below for more information. Please be sure to download and save the PDF application before working on the document. The fall 2018 funding window opened September 4 and will close on October 19, 2018. How Much Funding Can Match My Investment? The program will provide up to $10,000 in matching grants to small businesses for exterior renovations. Where Does My Business Need To Be Located? This is a citywide program for small businesses located in the City of Albany. Decorative or functional improvements such as storefronts and entrances, exterior signs, lighting, windows, awnings, exterior painting, brickwork and more. Impact Downtown Albany shows that not only is there a significant demand for retail Downtown, but that Downtown will thrive when the retail mix fully represents Albany’s unique local character. In today’s business climate when starting a new endeavor, private investment often cannot bear the burden alone. 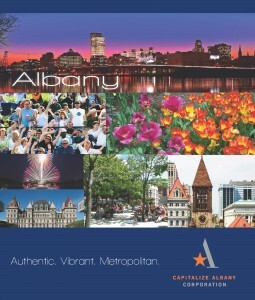 In response, Capitalize Albany designed its new Downtown Albany Retail Grant Program. The program, made possible with funding from the City of Albany Capital Resource Corporation, assists businesses new to Albany to establish a downtown retail location as well as existing City businesses that want to expand by adding a downtown location. Existing retail locations in core areas of downtown Albany may also be enhanced under this program. Grant funding can assist with new location renovation and fit-up costs or with exterior improvements to properties. We are now accepting applications. Now is the time to bring your business to downtown Albany. To learn why, you can also read this information packet here. To be eligible for this program, your application must be on behalf of a retail business, which is defined as a commercial enterprise that offers merchandise, food, or provides services to the public, the sale of which is subject to sales tax, and from which the revenue derived constitutes the majority of revenue for the business. Businesses that would be new to Albany are eligible & those located in the City of Albany that could successfully expand into a new downtown Albany location are eligible. Existing downtown retail locations are eligible for assistance with exterior improvements. Please reference the program guidelines or contact us for further eligibility questions. Where Do I Need To Be Located? Eligible projects must be located in downtown within the State Street and Pearl, and Broadway districts identified in the Impact Downtown strategy. Please see the program guidelines for a map of program boundaries. Capitalize Albany designed the Amplify Albany Grant Program to provide resources for the implementation of exciting activities and events that leverage the City of Albany’s most unique and strongest assets. The program, made possible with funding from the City of Albany Capital Resource Corporation, is enhancing the City of Albany’s commercial districts and businesses by providing grant funding to non-profits, businesses and other organizations that will create and execute short and medium term authentic, unique and buzz-worthy promotional projects, events and programming. The types of eligible projects are outlined in the program guidelines below. These events and other initiatives will engage residents and attract additional visitors to the City of Albany’s various business districts. We are now accepting applications. Non-profits, existing businesses and other groups such as business improvement districts and neighborhood associations are eligible. Please reference the program guidelines or contact us for further eligibility questions.